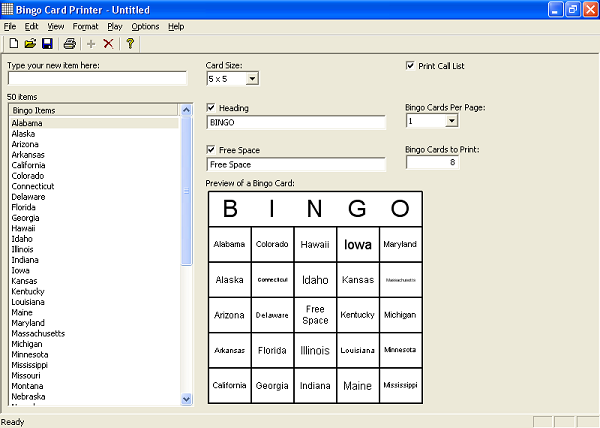 Software for creating printable bingo games is sometimes known as a Bingo Card Creator, a Bingo Card Generator, or a Bingo Card Maker. Bingo Card Printer is a very easy-to-use program. Below is a screenshot of the program's main screen. Complete instructions on how to use the program (including many screen shots), are included in the documentation on this web site, as well as in the Help which is included with the free download. "Box" and "Cover" images are shown for decorative purposes only, and do not represent the actual products which are delivered as Internet downloads. "Box" and "Cover" images on this site were created using CoverFactory. Register Now/Buy Now! buttons used on this website, are from the CB Vendor Graphics Pack.